Head to the island of Cozumel from Playa del Carmen with this round-trip ferry ticket. 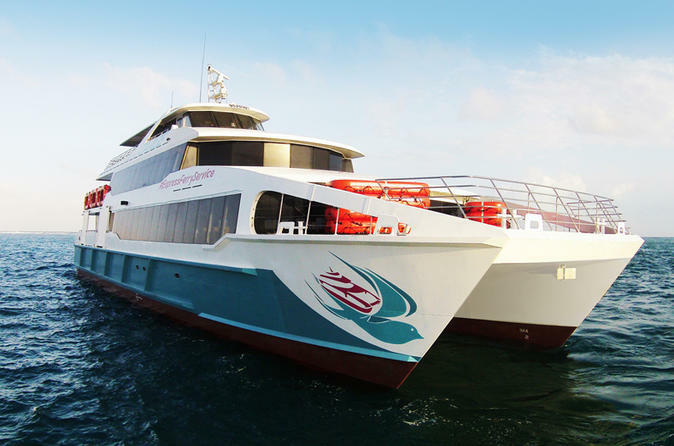 The 30-minute ride takes you across the Caribbean aboard a large catamaran that holds up to 400 passengers. Choose from several daily departures. Round-trip ferry (open ticket you can use it in all of our departures. Departing from Playa del Carmen: 6:45 am, 8:00 am, 9:00 am, 10:00 am, 11:00 am, 12:00 pm, 1:00 pm, 2:00 pm, 3:00 pm, 4:00 pm, 5:00 pm, 6:00 pm, 7:30 pm, 9:00 pm, 11:00 pm. Departing from Cozumel: 5:45 am, 7:00 am, 8:00 am, 9:00 am, 10:00 am, 11:00 am, 12:00 pm, 1:00 pm, 2:00 pm, 3:00 pm, 4:00 pm, 5:00 pm, 6:30 pm, 8:00 pm, 10:00 pm.